Leaves are beginning to drop like the temperature and it is the harvest time for these miniature crunchy cucumbers which we call it cornichon, like French. 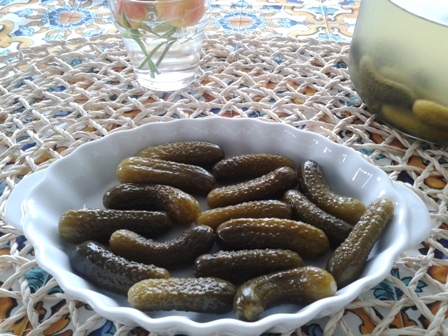 If you’re buying fresh cornichons (in English gherkin), you should look for small and firm ones. Wash the cornichons very well in order not have any mud on it. Put clean water to a pan and bring to boil then leave to cool (water distillation). When it is completely cool, mix sea salt and grape vinegar to the water. Sterilize a big glass jar (or jars) by running it (them) through the dishwasher. First, place 3-4 chickpeas in the bottom of the jar. 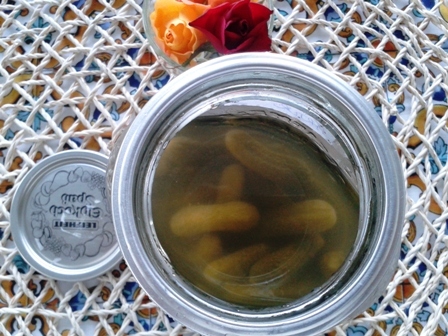 The pickles will develop easily by the help of chickpeas. Layer the cornichons with peeled garlic and the rest of the chickpeas one by one in order. Fit all the ingredients into the jar. Pour the prepared distilled liquid over. Cover with celery stalk and parsley leaves. Seal and set aside in a cool, dark place for at least one week, to allow flavours and develop. Before using, remove the chickpeas from the jar. If you put 1T. sea salt , it is recommended to store the jar in refrigerator, after opening. You are currently browsing entries tagged with gherkin at Aegeaneating.